We’re all painfully aware that Canadian Winters are cold and snowy for all but some parts of BC. According to Environment Canada statistics, 10 of Canada’s largest cities are walloped with over two meters (6.6 feet) of snow every year. The snow stays on the ground an average of four months. Unfortunately, that sets us up for a high rate of snow removal injuries or deaths. It’s snowing in the top 10 snowiest provinces an average of 55 days per year. It snows most often in Saguenay, Quebec, averaging 93 days in total. In fact, Quebec shows up in the top 10 for snow frequency four times, as does Ontario. Knowing that, it comes as no surprise that Quebec cities hold the top five spots for days with the most snow on the ground in Canada, ranging from 133 to 155 days each Winter. The wacky weather award goes to Calgary, which gets snow when the rest of us don’t have our shovels out. Calgarians are cursing the white stuff on at least a couple of days in May, September and October, more than any other major Canadian city. Even so, Calgary leads major cities for sunshine with the sun being out an average of 52% of the time (333 days per year). Shoveling light snow for 15 minutes is considered to be a beneficial physical activity, if you do it properly and you don’t have a medical condition that makes it risky. The biggest risk to Canadians, especially for heart attacks, comes with heavy snowfalls. Ergonomic Electric Snowblower. Click for details! Before you head out to shovel, avoid smoking, caffeine, alcohol, and large meals. Dress in layers (but not a snowsuit because you just drank a lot of water ;-)), and wear boots designed to keep you from slipping. Warm up! This is exercise and you should stretch before starting, with a special focus on your back. Do it again when you’re done. Have the right shovel on hand. Studies have proven ergonomic shovels reduce muscle strain. That said, the term “ergonomic” can be used loosely. Test shovels, paying special attention to how your back and wrist feel when you use it. To avoid heavy loads, a shovel should be 25-35 cm (10-14”) wide. 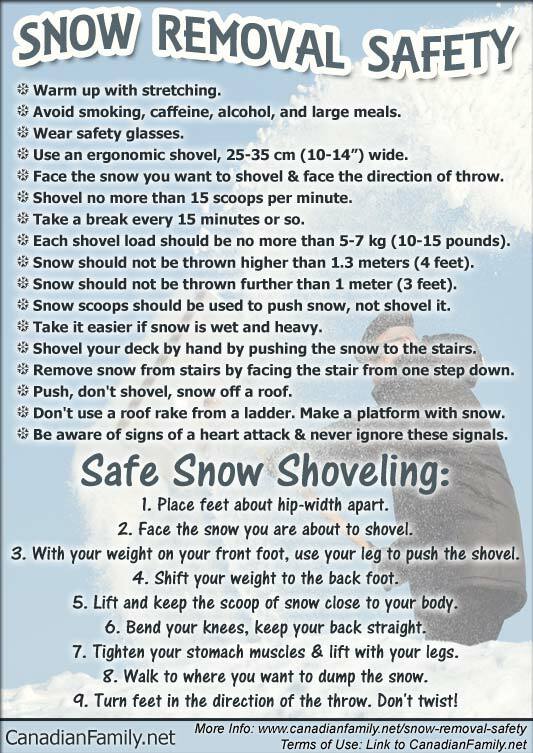 Scoops are fine to get snow out of the way, but using them for shoveling (lifting and throwing) is dangerous. You should be able to stand upright when using your scoop, with your arms bent at a 90° angle. Ice choppers are jarring to the arms and shoulders so they should be used in short stints. Apply salt to soften the ice before using a chopper, use both hands and take regular breaks or alternate between chopping and shoveling. Ergonomic Shovel. Click for details! Wear safety glasses in windy conditions and when using a snowblower. Safe snow removal should be done early and often. If possible, clear the snow as it accumulates if you’re expecting a lot. Proper snow shoveling is done with your feet placed about hip-width apart. Face the snow you are about to shovel. With your weight on your front foot, use your leg to push the shovel. Shift your weight to the back foot, breathe in, lift and keep the scoop of snow close to your body. Bend your knees, keep the back straight, tighten your stomach muscles and lift with your legs. Walk to where you want to dump the snow. Never twist. Face the snow you want to shovel and face the direction you’re throwing in. If the snow is heavy, push it to edge of the dumping area and throw it out of the way from there. Shovel no more than 15 scoops per minute and take a break every 15 minutes or so. If there’s someone around to help, you can each take 15 minute shifts at doing the heavy lifting. At a rate of 15 scoops per minute, each shovel load should be no more than 5-7 kg (10-15 pounds). At a rate of 10 scoops per minute, the weight of each shovel load can be increased to about 11 kg (24 pounds). Snow should not be thrown higher than 1.3 meters (approximately 4′), nor thrown further than 1 meter (about 3′). Take it easy if snow is wet and heavy. A 5 x 9 meter (about 16 x 30 feet) driveway covered in 30.5 cm (one foot) of wet snow, equals approximately 3628 kg (four tons) of snow! You should be able to stand up straight behind a snowblower. Maintain full control by moving slowly. If you have to push it, stay behind it as opposed to pushing sideways. NEVER use your hands to clear chutes or blades. Be sure to read the manual and use the machine as the manufacturer guidelines suggest. If the plow blocks your driveway with a pile of snow, get on it ASAP. The longer it sits there, the harder it will be to remove. Shovel your deck by hand by moving the snow to the stairs. Remove snow from stairs by facing the stair from one step down. Turn to throw (don’t throw snow over your shoulder or twist). Removing snow from your roof obviously comes with a risk of falling and requires proper footwear (and ideally a fall-arrest system). It is critical that you push the snow off rather than scoop and throw it from a roof. You can remove snow from your roof with a roof rake to avoid risking a fall. Make sure you take frequent stretch breaks as this method can strain your neck, shoulders and back. Remove fresh snow frequently, as opposed to letting it pile up. Using a roof rake from a ladder is not recommended. If you need to be elevated, making a platform with snow is a safer alternative. Be aware of signs of strain or heart attack and never ignore these signals. Using a snowblower does not eliminate the risk of heart attack. If you’re a senior citizen and/or have health conditions, consider hiring someone for snow removal. Some areas have snow removal programs for seniors or the physically challenged. Students are often a budget-friendly option. Ask your neighbours or post an ad at a local school. If you don’t know the person, make sure someone is with you when you open the door for payment, or arrange to mail the money, or pay online with Interac or PayPal. ??? How do you remove snow? Environment Canada Canadian Climate Normals. 1981-2010 Climate Normals & Averages. Occupational Health Clinics for Ontario Workers Inc. Snow Removal Ergonomics. 2 Responses to "Canadian Snowfall Facts and Snow Removal Safety (Infographic) ©"
handy infographic since this is supposed to be a particularly snowy year. many thanks. Excellent tips! I’m sving the infographic to run on my new site next year.